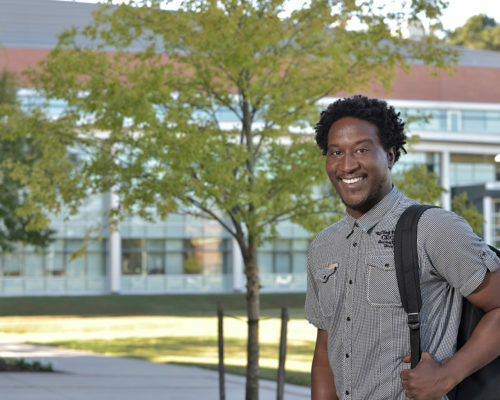 For Omar McDaniel, Richard Bland College of William & Mary (RBC) offered the second chance for a higher education that he desired. “Richard Bland put me back on the path to success,” he says. After graduating from Matoaca High School, McDaniel left the four-year college he started when he determined it wasn’t the right fit. While evaluating his options over the next year, McDaniel focused on two-year programs. 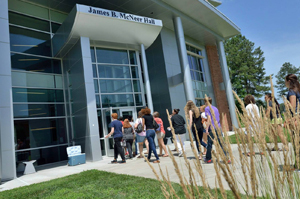 The small class sizes and access to professors helped Richard Bland College stand out. McDaniel, who loves music, decided to pursue a career in communications upon enrolling at RBC. However, soon after he found a new calling while tending to his grandfather in the hospital. At his bedside, McDaniel witnessed the care and attention nurses provided. He spoke with one of them about medical careers, and it had a profound effect on his academic plans. “I will finish my academic journey and become a physician’s assistant so I can help others in the future,” McDaniel explains. McDaniel used this newfound drive and inspiration to become an honor student and student ambassador. One of his most memorable assignments at RBC was an Exceptional Student Experience project where he and his classmates discussed how music affects the brain. McDaniel plans to attend Virginia Wesleyan after graduating from Richard Bland in May. He credits a number of mentors at RBC for his success.